Like any transition in martial arts, the cross step ("kosa dachi" in Japanese) has its uses - sometimes very powerful ones. It also comes with significant, inherent weaknesses. 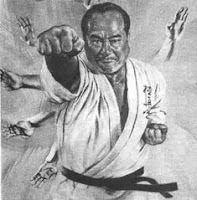 In karate there is the idea of kyo, something I was writing about at length this week, but actually abandoned in order to publish my Karate's Holy Trinity. Kyo is a moment of weakness in an opponent. 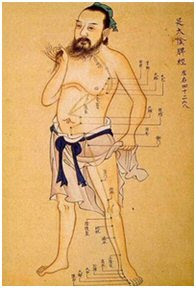 When he is recovering from an attack, when he hesitates between techniques or mid combination, when he is breathing in or recovering his guard. A cross step (kosa dachi) is such a kyo. Let me explain why. First, it is important to understand that the cross step is really a species of "tsugi ashi" - where one leg skips up to the other (or crosses over it) then the other leg extends forward to re-widen the stance again. The cross step is really just a longer, deeper tsugi ashi (what I think kenpo call a "drag step"). 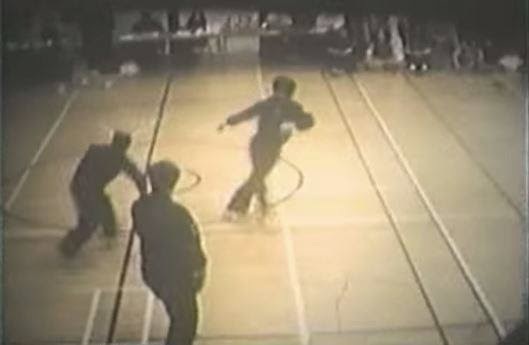 The tsugi ashi is problematic because the skip of the leg up to, or crossing, the other takes place in "dead time" (the "drag") - during which you are not really advancing on your opponent, but rather setting up for a bigger leap. The first part doesn't really do much on terms of applying your momentum towards your target; instead it merely allows for a very large (and usually momentous) second step. Which should tell you that the tsugi ashi (including the cross step) has another problem: it telegraphs. 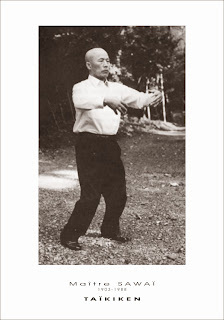 In this regard, tsugi ashi is the polar opposite of the "drop step" as used in most martial arts, especially xingyi. The drop step is where you extend the front leg first and the back leg second (when moving forwards) or vice versa (when moving backwards). It is known in karate as either suri ashi or yori ashi (depending on whether or not the second leg continues to overtake after the initial "drop" step with the lead foot). Apart from the extra time/telegraphing issue, there is another problem with the tsugi ashi / cross step: instability. During the whole of the "dead time" your feet are either together or they are crossed over. In both cases you are in a kyo - a position of weakess - particularly as regards balance. You can be swept off your feet, charged or simply punched - and there is precious little you can do about it during that moment of "dead time" when you are "flat footed" (I don't mean this literally but rather that you are relatively immobile compared to when you are not in "dead time"). In fact the cross step is seen as such a vulnerable position in boxing that it is often regarded as a sign of gait disturbance" - ie. 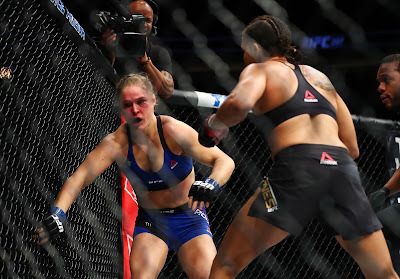 significant brain injury leading to instability / lack of bodily control and warranting the stoppage of the fight. 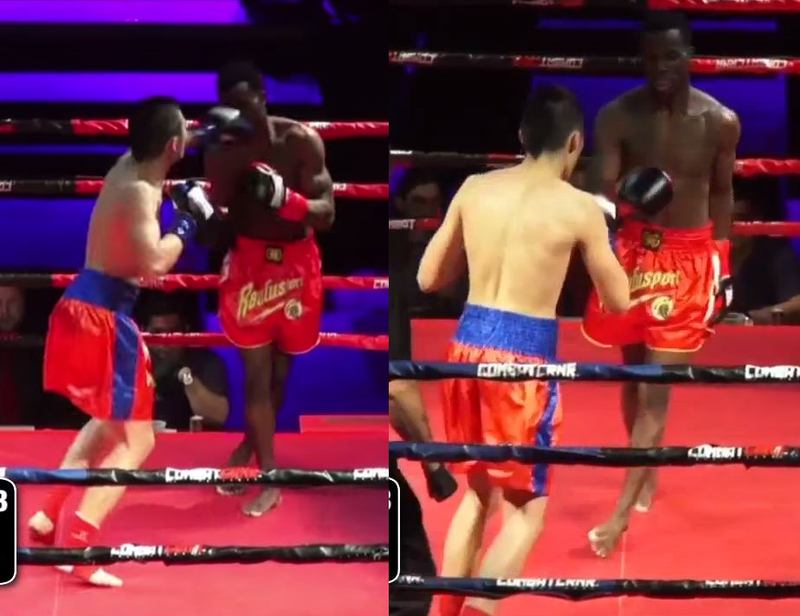 Consider the recent tragic of the death of amateur debutante Dennis Munson Jr - and the criticism of the referee, doctor and corner men for failing to stop the fight once they noticed tell-tale signs of gait disturbance - which included leg crossing. "It was the first indication of a deteriorating fighter. As the second round progresses the change in Munson becomes more apparent. His feet cross, putting him in a vulnerable position." I counted at least a dozen obvious leg crosses. And, contrary to what some people allege, boxers don't "cross" legs as they circle, nor do MMA fighters; rather they employ a skipping motion with both legs (exaggerated by fighters like Sugar Ray Robinson and Muhammad Ali and now employed by every single "faux boxer" on the planet). So why would you use a cross-step? Because it has very legitimate uses. 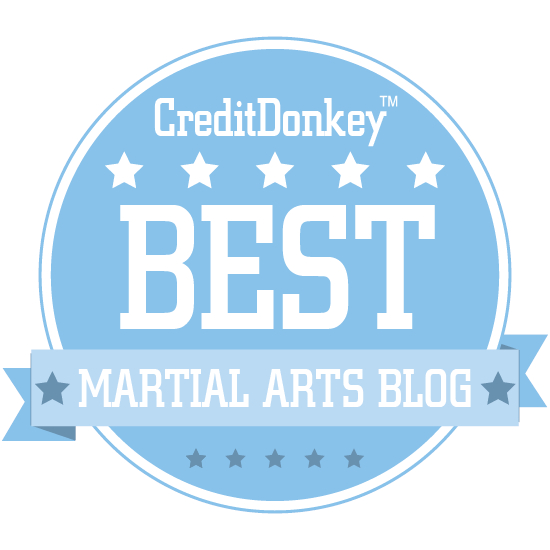 In karate, the naihanchi kata series make extensive use of precisely these sorts of tactics. But great care must be taken in using these torsional methods; they must be executed offensively, entering into the opponent's guard (mostly for civilian defence grappling). To avoid the pitfalls of timing, telegraphing and instability, they must be executed when the opponent is in the midst of his/her own kyo - ie. moment of vulnerability - and not otherwise. A second use of the cross step is to move across a great distance - and generate a lot of momentum from this movement. A prime example is when one is executing a side thrust kick. 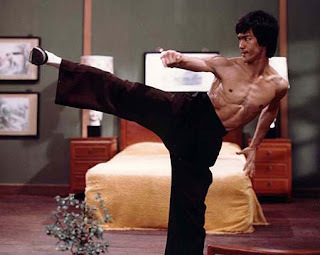 Bruce Lee did this spectacularly in his commercial movies and home films. You can see just how much extra ground - and hence extra momentum - Lee can garner by using the tsugi ashi "skip up" to get the kick. This use of the the cross step / tsugi ashi must also be executed with great care - that's probably why you don't see it all that often. You'll note that with the recent Louis Smolka kick, you don't necessarily need to cross your legs; a simple tsugi ashi will do. But the timing has to be just right. The extra time, telegraphing, and instability during the skip up are all very pressing reasons not to go out and try this in your next MMA fight. Not without understanding exactly when you can do so safely and effectively. The other thing to note from the above gif is that any sort of side kick can also necessitate a reverse tsugi ashi or cross step to recover balance, especially when the kick is high. This is one of the pitfalls of high side kicking that has caused this skill to fade in the MMA era, where broader rules (such as allowing low leg kicks) make such tactics highly risky while in the kickboxing era they were de rigueur. The third use of the cross step is found in arts like bagua - where it is employed (somewhat counter-intuitively) to move quickly to the outside against an attack. Note: it must be to the outside. It must also be quickly reset to a normal position, because you don't want to hang around facing your opponent in a cross-legged position. That "stance" is a transitional movement held for only the briefest of moments. I demonstrate this concept in the adjacent images against a deeply committed lunge punch - but it can be used against a cross or hook or uppercut etc. It just depends on the context. Note that in the application shown in the adjacent images you must move your front leg across to generate instant momentum transfer (a drop step). After that, you must quickly bring your back leg through (ie. 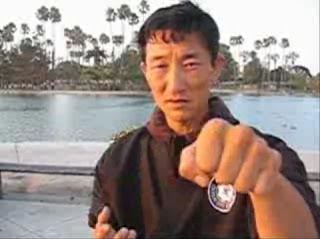 in the manner of a bagua step) so as to remove the "crossed" element and reorient yourself relative to your opponent. 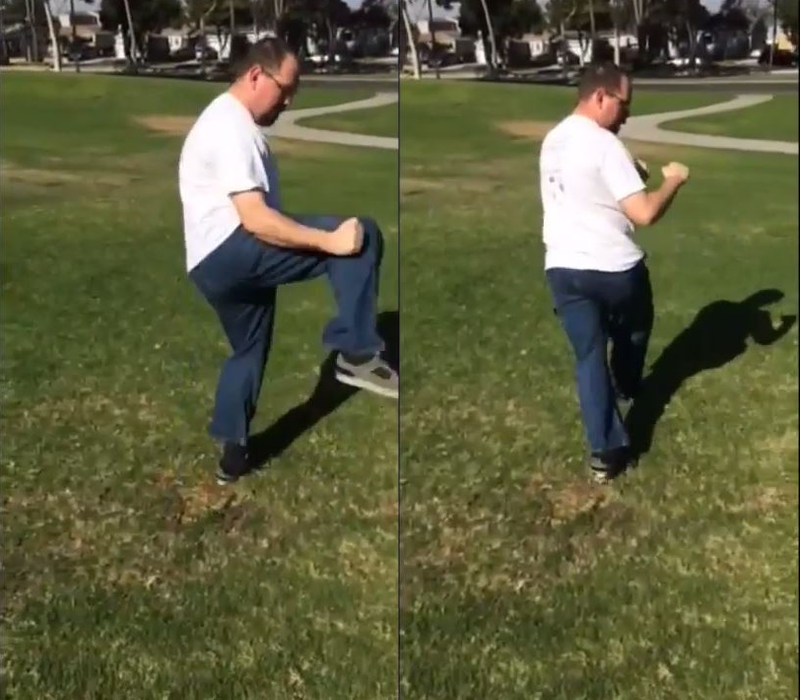 In this application, I demonstrate an elbow break using a momentary friction hold but there are many different options available with this stepping evasion; I'm simply using a rather literal interpretation of the first palm change. It is important to note that I would never use this application on the inside: that would invite disaster! I'd be walking straight into his follow up punch - and doing so in the most unstable position there is. 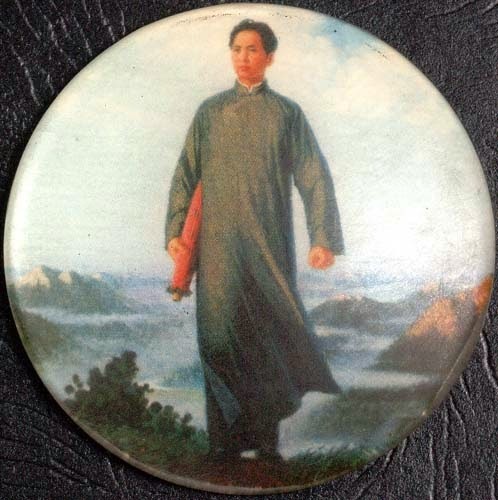 So if my front leg couldn't step across to the outside, I would have do something else (bagua has other alternatives, as do other fighting methods). I know I'm not popular with kenpoists for recently taking on their senior grandmaster, Ed Parker. 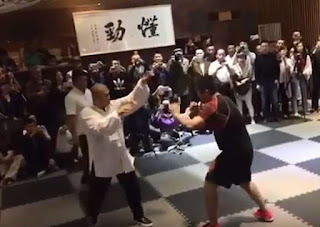 And I really didn't want to go back to criticism of him; I think he made some important contributions to the martial arts and I wanted to leave it on a more positive note after my last concessions towards him. But one element of his (in my view flawed) '60s fighting method that Parker doggedly retained up to the end (and which is kept by many kenpo lineages - although by no means all) is what is called the "cover out" - a retreating cross step employed after you've managed to dispense a string of brutal counters to your opponent. You can already tell that I don't like this technique. The reason is simple: it contravenes every single principle of appropriately using the cross step. First, it is being used defensively - to retreat. That is the time of your biggest kyo: your moment of greatest vulnerability. I've lost track of the number of times I've been swept when stepping backwards in the face of a particularly fierce onslaught; my opponent has waited until I started to step and caught my feet at the mid-point - the "dead time". I'm afraid this is exactly what the kenpoist is inviting with the "cover out" (at least, one that uses a cross over retreat): they are attracting a devastating unbalancing attack. In my view, any retreat would preferably employ a previously-mentioned suri ashi - in reverse. In other words, you would engage your back foot first (to get instant momentum away from the target) then follow it up with the other leg stepping back past the first leg. That's if you're serious about "putting distance" between yourself and your opponent (what I understand to be at least one purported justification of the "cover out"). And presumably, you would do this because your opponent might not really be "finished off" as you had hoped with your string of brutal counters - so you're retreating out of an abundance of caution. Or perhaps you're doing so because he might have accomplices (which raises the question of whether you're backing into these accomplices!). On the latter point, I've heard it said that the "cover out" with a cross step "allows you to see a wider field". But I don't see how a cross step can do that - at least, any better than a normal step. Alternatively, if your string of counters has obviously been so successful that your opponent is "down and out", and you're confident that he/she has no accomplices, why would you bother stepping back with more than a simple, normal step? Why step back at all? In respect of the latter, it concerns me that many kenpoists demonstrate this "cover out" after one technique that might not be all that "determinative". 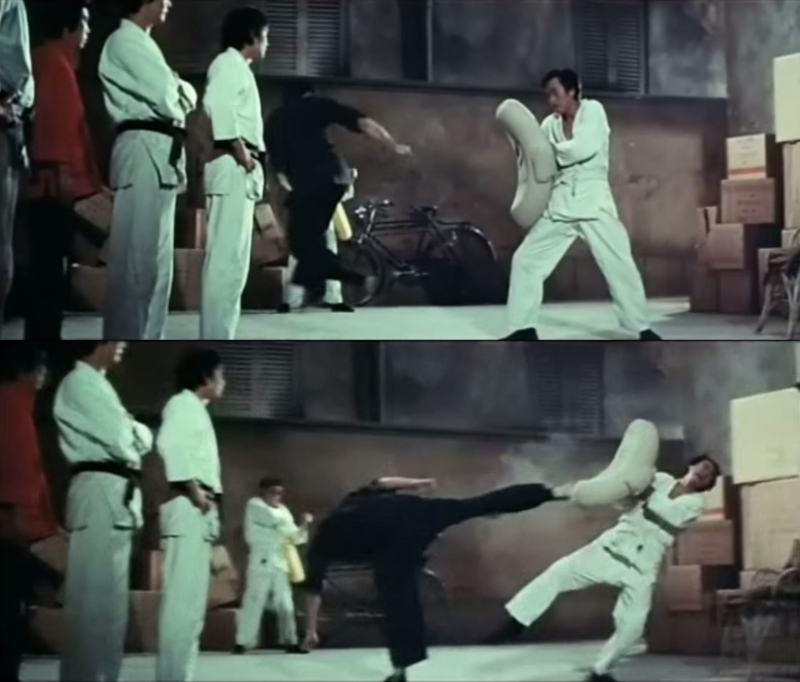 In the adjacent pictures, the practitioner does the "cover out" after a snap kick to the abdomen - which fighters routinely absorb. I wouldn't be stepping back into a cross-legged stance after such a kick even if I were Anderson Silva or Lyoto Machida; to do so would invite catastrophe should the kick miss or be absorbed, or should opponent recover quickly and pursue. Certainly grooving such an automatic "unstable retreat" after a technique like a snap kick is, I think, a bad idea. 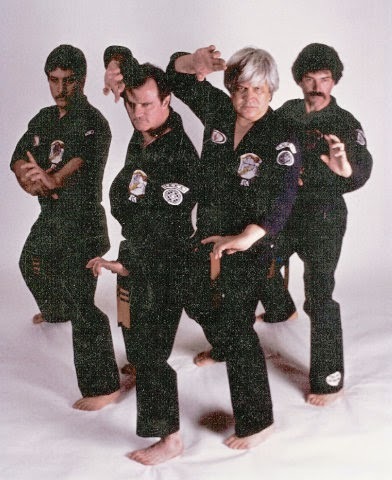 So I see this kenpo "cover out" as almost certainly a hangover from Ed Parker's rather strange '60s era fighting method. In this respect the "cover out" is not unlike Parker's strangely gnarled "hand postures". I'm not sure what these are - they look like the various finger and hand strikes shown in "Secrets of Chinese Karate" but under Parker they seem to have morphed into "kamae" - ready postures or "guards", albeit ones that dangerously present the fingers for jamming and wedging, especially in the face of fast and hard attacks. 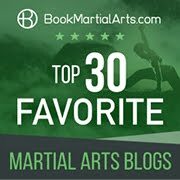 It seems to me that these sorts of "techniques" are more about what people used to think karate/jujutsu/gongfu look like than actual fighting methods. Accordingly I think the cover out (and the hand positions) should have gone the way of the judo/karate chop and other seemingly "Oriental" affectations that plagued early Western exposure to Eastern martial arts. The human body only moves in so many ways. Fighting tactics don't change much as between cultures as a result. There are a few constants common to all fight schools, eg: "turning your back to your opponent is a bad idea". Crossing your legs is one of these. But just as "the rule against turning your back" doesn't prevent you from doing the odd, judicious, spinning kick/backfist/elbow etc., so too is there a time and a place for crossing your legs. I think doing so in retreat is hardly ever going to provide such a time or place.